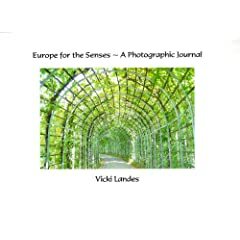 Landes may have captured her own sense of wonderment as she traveled in Europe and beyond but, for this reader, neither the pictures nor the prose serve each other well. The book is not a tourist guide — too incomplete for that, nor an in-depth series of perceptions about scenes and sites experienced and felt. It is a scrapbook of a kind, a mélange of photographs and prose that hold little interest for the reader. It simply doesn’t grab you and in places is remarkably superficial. Photographs of public gardens, castles, interiors of museums, et al are often too dark and have not been color corrected for publication; consequently, an amateurish cast afflicts many of them and defeats one of the purposes of the book, I suppose, to imaginatively seduce the reader into the sensibilities of the author. Imagine postcards falling out from a packet at random and you have an idea about the book, for there is no real eye behind them. Postcards inform or relay images, no more. Instead of recording, Landes might have been more effective exploring newer compositions for her shots, to be more expressive. However, if she was collecting photos for her own journaling, she succeeded. Landes does not communicate well visually, for there is a decided flat affect to the photography here and the prose can border on the kitsch. What is jarring in the book is that I could not find a picture with human beings in it! The text is off-putting, in that the font style is a print that it is more annoying than engaging. Print should be “invisible” in that what is expressed is absorbed readily. In this instance it attracts attention to itself. A skilled editor would have done a better job of it all. Overall, the production values are not well-realized here and the publisher has not served Landes well. Photography, of course, can say more than words which here are melodramatically stilted and border on self-parody: “Pan hides among the living maze…” “Converse with the ducks…” And this: “Explore the surrounding forest and search for Red Riding Hood, consider leaving bread crumbs for little Hansel and Gretel, and keep an eye out for a long lock of blond hair hanging from a tall tower…” Oh, dear. What might Jung make of this? The book is best as Landes’ own record of her travels for her family, but as assembled, she fails to share her own wonderment. Next Entry 325. Alternative NEWS: About Us ~ Updated!